I dug the broken greenish var 4 JF last wknd not realizing there was a JF frenzy going on at same time here on the blog. Reading all the JF posts on Mon. I thought I'd post some pics of this wild light olive-amber "super crier" var. 4 star-base JF CUTTER. Anyone that collects Cutters knows how hard it is to find this 'last of the JF run' in any good colors. The majority are usually an orange amber coloration, with a few seen in old amber or dark olive amber. Someone call the bottle Dr. ..... the patient needs saving ! After a little gluing here and there, I thru it up on my shelf with a flat-A and a Fat-boy to see how it would've held-up in a roll-call line-up of JF's. As you can see, it would've smoked them all !! Bad-boy didnt stand a chance of surviving though.... The neck was in the privy, and when it came out was the topic of much oohing and awing and was agreed by all to be from a Cutter, most likely an earlier Circle Cutter ...and that was that. Well, two hours and a filled-in hole later, I open-up a little 2' trash pit 8 feet in front of where the privy was, and low and behold out from the trash pit rolls the body of the bottle the killer neck goes on. Turned-out we were half right , it was a Cutter, but not a Circle ! That's two broken killer greenish Cutters for me this yr. The 'wailing wall' is lookin good, but I'm due to dig one that's not gonna play Humpy Dumpy with me, as I'm startin to run low on glue ! I've really enjoyed the recent postings on Cutters, so I thought I'd add a few more pictures to the frenzy! In the spirit of jumping aboard the J.F. Cutter bandwagon, I thought I would post a flask (what a surprise, I know). You can sure see why J.F. fifths and flasks are so popular. Great heritage, color, crudity, and enough to go around, where almost anyone can have not only an example or two, but a NICE example or two. That cannot be said for many other early whiskies. Here is a very well struck TF-9 pint flask. There are likely about 40+ of these known total, in various condition. They range from a dark amber to old amber, all the way to yellow with a tinge of green. It is difficult to get one with color, character, and strike. The values on these keep climbing, and today will set you back between $1200 and $3000. You sure do not see them at shows, or available anywhere else for that matter. I have actually seen more Crown shoulder flasks available in the past year than J. F.s. Not sure why. Also, when was the last mint example dug? Maybe I am out of the loop, but very few early flasks seem to be dug anymore. I have referred to this flask in a comment somewhere in this blog, however did not post a photo. This glob Brickwedel was discovered in a china cabinet in Siskiyou County Cal. in 2007. The elderly lady was digging a drainage ditch in her basement(?) when she uncovered this flask. This was in the 1970s. It was placed in her china cabinet along with some blob sodas (aqua Jacksons) and some 80s druggists. On my wedding anniversary in 2007, my wife presented this flask to me and related the story of it's purchase after lengthy negotiations. I still do not know the details, but it sure gives one hope that there are some nice examples out there undiscovered until by chance someone with an appreciation for good glass (or a husband hopelessly addicted), somehow stumbles upon it. The memories, and stories that surround these discoveries would make a book in themselves. Here are a few more pictures that have found their way into my email box. If you have anything that you would like to share send it on to me. If you have a story to go with it and want to sign up as an author even better. Keep the stuff coming, we love it. Dave S. of the Salt Lake area has only been collecting for couple of years. He has been ghosttowning for longer. The influence of seeing shards of all that early S.F. blown glass scattered around the hills is evident on the top shelf. The bottom shelf is starting to include a few globs. Now we've done it! Sorry Dave. collector and now digger sent me this photo. This is what I mean by digger. WOW! What a color. Found a broken Miller's fifth in the general area also. Kelly, if that list of new, best friends hasn't gotten too long can I be on it?? Here are a few photos from L. Westfall that show a portion of his fine collection. He has been at it for just a few years, has built some nice groupings... buying / selling / swapping / digging.... however you can add a bottle or upgrade an example. Just keep at it. I will quit posting for awhile, but I just wanted to get caught up. Please bear with me. I cannot recall any Lilienthal flasks (or even fifths for that matter), being featured on this site. While I do not claim to be an expert on this company, there is a wide array of early glass that comes wonderfully colored and crude. Here are two examples of some of the earliest flasks from Lilienthal. The green example is the "high S.F." in a larger than pint size. It was recovered from the Comstock years ago. There are only a handful in this strong green coloration, and a few in a light yellow olive, ranging to old amber and even yellow amber. They remain a relatively available flask, but are becoming tougher to find. 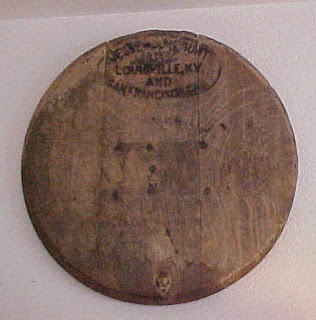 The smaller example is referred to the Lilienthal "cognac". They are smaller than a pint in capacity. These are actually considered a very scarce flask with perhaps 12-15 examples in collections. The typical color for these is a dark chocolate with very few being a regular amber. Several years ago, a few in a light yellowish color were dug from the same hole in Nevada. Each had something different going for it, though they were the same color. One is super whittled, one has a monster strike, and one has a huge top, and swirls ( the example pictured). In the 35 plus years I have chased Oregon glass (Hey, someone has to! ), I have had an opportunity to examine, and own some very beautiful whiskey fifths, and flasks. Oregon has comparitively few early whiskies than California, and all are very scarce to rare. One particularly beautiful fifth to me at least is the Portland Hotaling "rick rack". 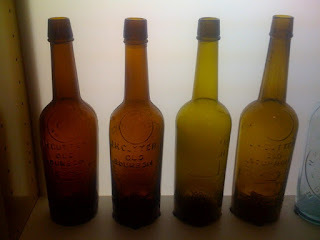 These bottles were produced in the early 1880s, and are a great reminder of making one's mark in the marketplace. This bottle comes complete with crossed swords, a large crown, and that unique zig zag design around the full face embossing. 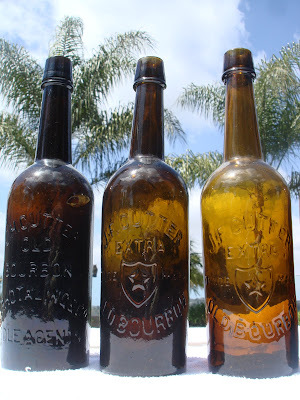 There are two versions of this bottle, one with bold, and thick embossing, commonly called the earlier variant ( T-56) these come by and large in the same medium amber coloration, and skinny applied glob top. I have not seen this unique lipping treatment on any other fifth, and the charactaristics, as well as the consistency in color of these scarce bottles, indicate extreme quality control in their manufacture. These fifths have been dug in Oregon, Washington, and Idaho. I am not aware of an example being dug in California, but would be interested to know if this is true. One version that you do not see very often is the "light rick rack". This variant is extremely rare with maybe 6 known in any condition ( T-57). Since John Thomas's first book on whiskies, this was considered a later bottle (1884-90). I have doubts about this. I have never seen a tooled top example as claimed in the book (have you? ), also this bottle is much more tradional in profile, lip treatment, and extreme crudity to indicate it is actually earlier than the more commonly seen rick rack. Interesting that the heavily embossed version is much more common with perhaps 30 or so known, and more elaborate, and widely distributed. 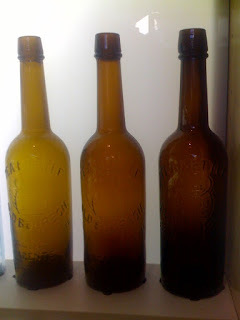 Why change the mold, top, and embossing to a much less fancy bottle when the one type was selling so well? Why so rare? I have compared the T-57 with many T- 56s and the T-57 blows it away in every aesthetic area except detail of embossing. To find a T-57 with a strong strike is super tough, since there are not a bunch to go around as it is. If you are fortunate enough to own one of each, compare them, and see which one looks more like an early whiskey to you! Here is a beautiful crier that recently came out of an early privy. 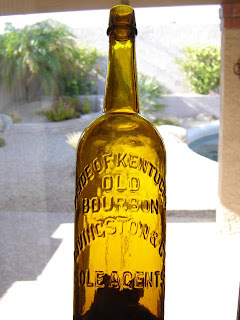 I've always loved these early western bottles but have not heard many collectors speak of them. How many examples of this variant and the other variant without the star are believed to exist ? What colors have they been seen in ? Do they come in both a 5th and 6th size ? Andrew, here is the dark green shard found in Nevada City..
maybe a bit darker green than your piece. 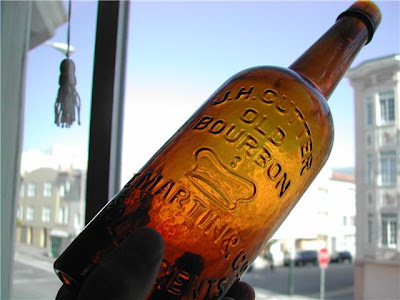 J. H Cutter Old Bourbon / Bottled by A.P. Hotaling: The Rodney Dangerfield of glop tops. Face it, ya gotta start somewhere. Not all collectors can break the ice of western whiskey globby collecting with a Clubhouse... Sure, some of us were lucky enough to have gotten in on the ground floor before stuff went goofy. My first glop, a Tea Kettle the color of Herseys dark chocolate, cost me a whopping hundred dollar bill back in the early seventies. It was hammered to death with whittle and ranks as one of the most attractive TK's that I've had the privilege to care take. Trouble is, earning power is down and prices for prime examples of western whiskies are up, way up. I've had that same Tea Kettle on four different occasions; ea ch time the price of admission went up and up. It last sold in 2005 for $1500~. Which brings me back to the J. H. Cutter / Bottled By which, in my opinion, is one of the best values out there in globby land. Sure they're common as chicken beaks compared to most glops and yet they possess loads of character in many cases and are available in a myriad of colors. We've recently seen a surge in interest with the JHC / Sole Agents and maybe it's time for the "Bottle d By" to come into it's own. I've got around a dozen Bottled By glops right now and, at the risk of being laughed at, thought it would be fun to do a blurb on the bottle. (A No. 1) examples now bringing crazy dollars and the A No. 1 variants becoming a close runner up. Hotaling first introduced the Bottled By variant in the mid 80's. 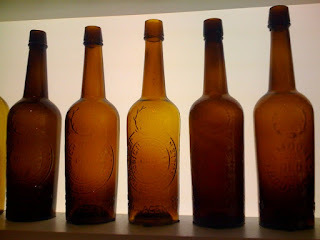 The glassworks that produced the bottle employed the latest techniques, including air venting, and as a result, they are generally not as crude as it's predecessor, the Sole Agent. Still, there is plenty of eye appeal to go around and I've seen a myriad of them with whittle to die for and spillover that slops nearly 1/2" down the neck; just the things we look for. And then there's colors; everything from root beer brown to lollipop yellow and from deep red to brilliant orange ambers. Ok, so there's probably a few hundred to go around. Supply and demand dictates price, but not necessarily value. And that's where I stop to ponder. How come these critters are still selling in the $50~ - $75~ range? That's one heckuva value! "It don't get no respect". Now that's what I'm talkin about Kentucky Gem, "stellar"!!! What a friggin Nice J.F.!!! It looks whittled as all heck too. I've seen more nice Star Shields on this blog lately than I have in many years of collecting. 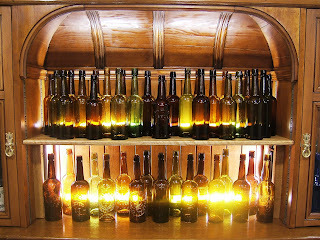 Seeing bottles like these on a monitor is one thing but to actually see some of them up close in person would be just awesome. Hey all you J.F. Star Shield guys that are coming to Downieville, we might want to have a J.F. "Shootout" or a least see some of that stuff. Or better yet since some of the top guns from the West can't make D-ville but will be in Auburn, lets shoot it out there. Take your best shot son, anyone up for a showdown??? Dug September 1971; area of Bridgeport, Ca. It came in a collection a few years ago along with a lot of other pretty strong western glops. Funny thing; the collection was in the home of heavy smokers. The bottle shelves were next to the kitchen, where a steady diet of fried foods was constantly being prepared. Adjacent to the displays was a wood stove that belched soot into the room. My hands literally stuck to the bottles as I picked them up and judging color was a crapshoot at best. I assumed that the bottle was a standard run of the mill amber. Imagine my delight when it emerged from its warm water bath of sudsey ammonia. Best described as loads of green at the shoulder and a strong transformation to old amber at the base. It's got a smooth base, a big top and the tip of the A in Extra is pointy. But the big question is... fat boy or not? More Morrison stuff.... sailing the high seas with barrels of his favorite bourbons ! Here are a few ads I located about 15 yrs ago when I started really getting into the whiskey research. They are most likely the same ads Thomas refers to in his books, but comingled or confused them in the text. I thought it would be cool for everyone to see the actual ads without editing as they appeared in the day. These ads are from the Wine Dealer's Gazette and are interesting because they put a few things a little more into perspective, especially re the Clubhouse bottle date and Blue Grass Whiskey. Morrison's Sept 1872 ad for "Blue Grass whiskey", which originated from the Blue Grass region of Ky, was sold by other S.F. liquor dealers as well. The J.M Gowey & Co. ad next to Morrison's helps clarify this, where you can see in the ad that more than one dealer was importing it to the West. 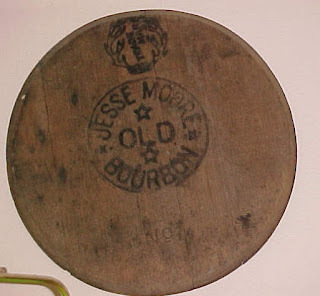 Morrison's angle was to cite the names of the ships that his barrel lots arrived on, as sometimes ships had a rocky voyage around the horn, and their cargo's survival was much appreciated. It was also thought it kept the whiskey in the barrels further aged and agitated by having endured a lengthy journey in rough seas. also regauged by the City Gauger. 316 Sacramento and 321 Commercial Sts. Stag C.D. (which I believe the "C.D." represents "Copper Distilled") appears to have been his biggest seller. Judging by ads, it also had the longest run. Can you guys imagine what an embossed bottle for this would've looked like ! I can see a giant full-face Stag pictured on the bottle. Too bad Morrison didnt order a bottle for this one ! 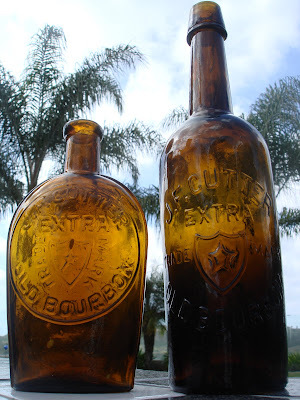 I think he had the California Clubhouse bottle made and no other embossed bottles for his other brands because he felt that bourbon was going to be a very special product for the West and was made special and exclusive for him to sell in California. He was the only importer of it. Below is an original Stag C.D. billhead from my collection, dated Sept 5, 1873, that also has Morrison's autograph on the reverse side where he signed the invoice as being paid in full. I found it unusual that the billhead doesnt mention any of his other brands. Most billheads list the dealer's principal product line. Was Stag CD such a big seller that it had its own billheads? Then why no embossed bottle ?? Check out the link we just put up for Collectors Weekly. I hate to guide you away from this site, but you might get a kick out those 'ol boys. It might even get you in the mood to do a little digging. Scroll down to the videos on the left. I watched a couple of them. I'm sure I'll watch them all soon enough. I can't say that I agree with all their techniques???? Unscrewing a bottle from the hole? We have all done it, but about the time you tear a big chunk off the top of a nice bottle... that's the last time. Rubbing the gritty dirt off your find, with those gritty gloves. Keeps Lou busy! What the heck, we all get excited. ---well not quite, certainly not just your avg. "fatty". "Castle" sent me this photo of his green var-1 J.F. Cutter(t-46). 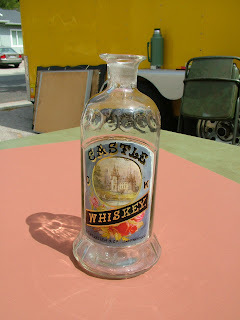 This infamous bottle is the one that was dug in Austin, Nv. in the mid 1990's. "Infamous" only to me, I missed out on it and have wanted a green fat boy ever since. Have not seen another.